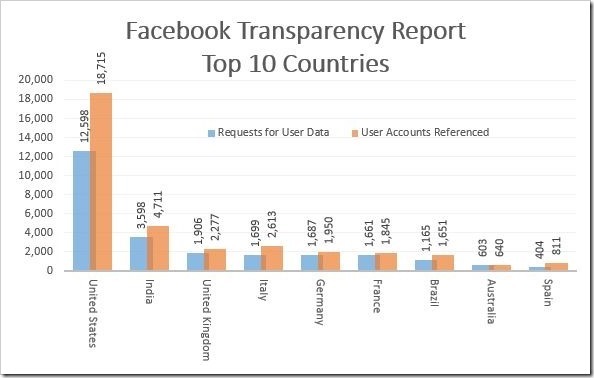 According to Facebook Transparency report released for 6 month period between July-December 2013 shows that India leads all the countries in the world when it comes to blocking of content. 4765 pieces of content on Facebook put up by Indians were blocked during the 6 month period. The report says that these content pieces were restricted primarily on the request of law enforcement officials and the India Computer Emergency Response Team under local laws prohibiting criticism of a religion or the state. Between July and December 2013, Indian Govt and law enforcement agencies made 3598 requests to Facebook, that referenced 4711 users or accounts. Among all the requests, 53.56% of requests produced some data. In the first half of 2013, Indian Govt agencies made 3245 requests for details on 4144 accounts from India.